We used to talk into our phones so that we could chat with whoever was on the other side of the line. Nowadays, we talk into our phones for a whole bunch of reasons. For example, voice assistants like Siri and the numerous Siri alternatives for Android 5 Free Siri Alternatives for Android: Which Is the Best? 5 Free Siri Alternatives for Android: Which Is the Best? A few years ago, you’d only see someone talking into their phone if somebody was on the other side. Fast forward a bit and now talking to your phone when you aren’t on a call... Read More have become ubiquitous. 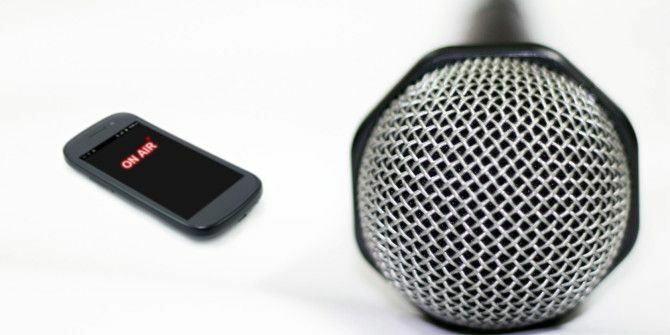 It just makes sense that voice and phone work together well, so why not use your Android as a voice recorder, too? 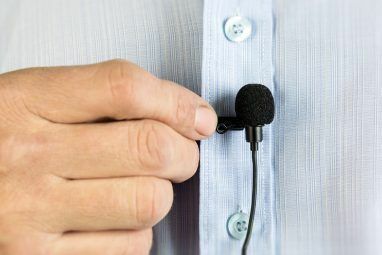 Tape-a-Talk Voice Recorder is a quick and easy way to record your voice – or whatever other sounds are in the vicinity. Need to record a group meeting for the minutes? Want to record an interview? Maybe you just need to save a thought you have for later? 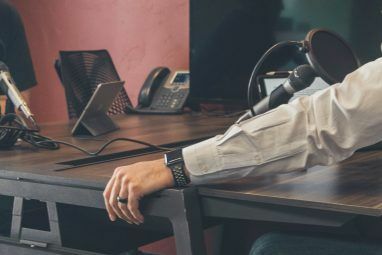 Voice recording comes in handy more often than you think, and Tape-a-Talk is perfect for it. Tape-a-Talk can record in two modes: Low Quality (.3GP) and High Quality (.WAV). When recording with my phone, I didn’t actually notice a big difference between the two, but there are other variables in effect, namely microphone quality and speaker quality which differ from device to device. For best results, try both of them and see which one sounds better to you. In the options, you can also change Tape-a-Talk’s sample rate (ranging from 8 kHz to 44.1 kHz) and sample format (a choice between 8bit and 16bit). Combine that with the quality setting above and you’ll be able to customize your sound recording quality to best fit your needs. Tape-a-Talk also comes with a widget that you can place on your home screen. It’s useful since you can Start, Pause, or Stop recording straight from your home screen, and the recording will continue even when your screen is off. Once you have a few recordings under your belt, Tape-a-Talk makes it easy to manage them. First, in the options, you can set the location where all of your recordings are stored. Recordings must be stored somewhere on the phone’s internal SD card. Renaming and deleting recordings is easy and, with a tap of a button, you can set a recording to be your ringtone as well. Tape-a-Talk also provides a few tools for managing each individual recording. For example, you can cut a clip from a recording and save it separately as long as that recording is in .WAV format. Sometimes a .WAV recording will become corrupted, but Tape-a-Talk’s Repair feature will handle that for you. The default name for a recording will be the date and time of recording, but in the options you can set the name generation rule for each new recording. Pretty nifty. All in all, Tape-a-Talk management is straightforward. I admittedly don’t have much experience with these kinds of voice recording apps, but as a first timer, I fell into the groove of Tape-a-Talk rather quickly and I don’t have any qualms here. For those of you intending to use Tape-a-Talk for more than just personal reasons, the sharing features are a nice touch that will prove useful for quickly circulating recordings among your friends, colleagues, or what have you. The most useful feature, of course, is the automatic send dialog that pops up after each recording, but you must first enable this in the options. Recordings can be sent to other apps on your phone, such as Catch Notes Catch Notes: A Full-Featured App for Portable Note-Taking [Android] Catch Notes: A Full-Featured App for Portable Note-Taking [Android] Portable notes have saved my life on more than one occasion. Not in the literal sense - thank God! - but in this day and age, when information is being thrown around at such high... Read More , for use there. You can also upload your recordings to Dropbox Better Than The Default: 5 Fantastic Dropbox Apps [Android] Better Than The Default: 5 Fantastic Dropbox Apps [Android] I'm a huge fan of Dropbox. I have been using it extensively for team collaborations, to transfer files between platforms, and for backup purposes. Dropbox' key to success is its ease of use, which is... Read More or FTP as long as you have the proper apps installed on your phone. And if you prefer the traditional route of email, Tape-a-Talk can send out your recordings in an email to multiple recipients. Though Tape-a-Talk is available for free, it is supported by non-intrusive location-based ads. I don’t mind the ads but if they aren’t your cup of tea, you can pay $1.30 USD for the Pro version of Tape-a-Talk. If you’ve never used your phone to record messages or conversations, this might be the time for you to give it a whirl. What do you have to lose? And if you already record messages in some way or another, whether with a note-taking app Better Than a Notepad: The 3 Fastest Ways To Jot Down Notes on Android Better Than a Notepad: The 3 Fastest Ways To Jot Down Notes on Android Whether you need to jot down ideas for your next project or items you want to pick up at the store, it's always good to have something ready for taking notes. Many people carry around... Read More or otherwise, Tape-a-Talk may be the one that complements or even replaces what you already use. So what do you think? Will you use it? Or do you see any glaring flaws that will keep you away? Please share your thoughts with us in the comments! Great idea to have a app for voice recording. So I spend a bit of time on google play to find better alternatives. Very worth checking out at least. I was just thinking of looking for an app like this for recording thoughts while using the Oculus Rift. I'll give this a try. These apps will sure come in handy, I already thought many uses for them! 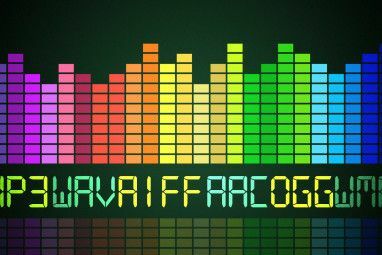 The 10 Most Common Audio Formats: Which One Should You Use? 7 Distraction-Free Text Editors for Android Compared: Which Is Best?